Its highly unlikely that any wire not sold specifically as pure iron wire will actually be iron. Structurally iron is inferior to steel and also much harder to make. Ferrous metal terminology is used very loosely and many things that are called iron are really just an alloy. Cast iron for instance is iron alloyed with a high percentage of carbon, steel is iron with a lower amount of carbon but is much closer to being "iron" than cast "iron" is. Soft iron wire is usually just mild steel that has been annealed after it was drawn. Pure iron is very rare in nature since iron readily forms oxids and alloys when exposed to other elements. I would imagine that very little is made from pure iron for various reasons, however the important characteristic for the ballast resistor here is the increase of electrical resistance with temperature, the opposite of the ceramic element. It seems that steel has about half the resistance change per degree that iron exhibits, so that would make steel wire less effective, but by the same token it appears that nickel wire would be even better than iron, and may be easier to obtain as wire. Note that this would be pure nickel, not nichrome or similar, which effects very little change of resistance with temperature, hence it's use as heating element. Then why not run two sets of steel wire in parallel inside the gas ? but if I understand correctly, the problem is the steels reactance to temperature differences (half that of iron). Doubling or halving the length of the wire won't change that. Needs More Steam! - Personal blog on my steampunky hacks and mods. Chaps, a ballast should be enough, me thinks. Specially since it's mentioned by name! Indeed and indeed Mr. Buddah! Two equal resistors in parallel halve the resistance, two in series double it. Two equal capacitors in parallel double the capacitance (think of doubling the dielectric area between contacts), while two in series halve it. Two equal inductors in series double the inductance (think of doubling the number of loops in a coil), while two in parallel halve it. I'm going to try to crack this little problem, but on paper. God knows I need the review (jeez!! I used to build surround sound processors back in my early college years before I got serious with the aerospace stuff. I've left that hobby far behind in my mind). Theoretically you should be able to use the RL circuit . Unfortunately the glower is a very nonlinear load. In my prototype rising the current from 0.45 A to 0.48 A caused the thermal deformation of the glower. This is why I prefer building a constant-current power supply for my lamp . I received a PHILIPS 195U HOLLAND BARRETTER today. Anybody know where I can locate the specifications for it? It's showing 11 Ohms of resistance, but I do not know what kind of curve the Barretter will have nor at what current it will change. It has about 25 inches of wire, but I am unable to get my micrometer on it. It does appear to be close to the .002 inch diameter. Any solid info on this unit? Baring that, any speculation? 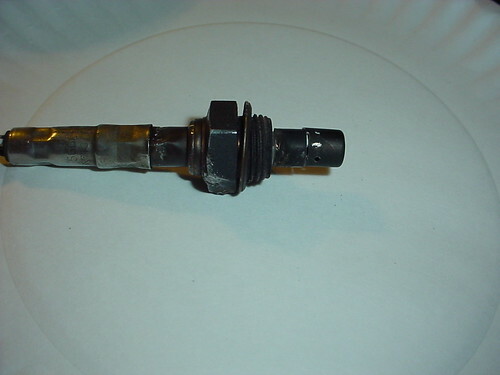 My son-in-law recently purchased a used truck and it needed an oxygen sensor. So I got the old one and cut it apart. I don't think it would have made a good element for a Nernst lamp. 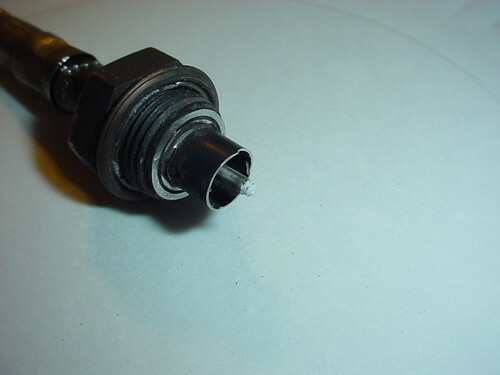 Below are photos of the sensor cut apart. 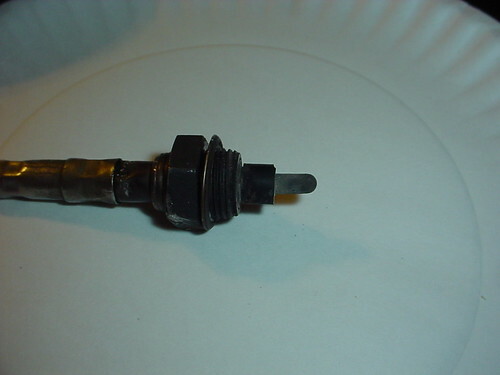 The Sensor, I had already cut the outer metal open. It seems that there is a type of self-regulating heater element that is masde of some sort of ceramic with a Positive Temperature Coefficient, which is just what we are seeking for the baretter. Do you mean connecting the heater element in series with the Y-stabilized zirconia glower? The ceramic heater builds up heat first, increasing it's resistance as it heats up, the glower now hot incandesces lowering it's resistance, the combined heat lowers the heater element even further and the combined temp coefficient is just positive? (or neutral?). Sounds too good to be true in light of the sensitivity pointed out by Mr. Conciousflesh, but heck, why not give it a try? I would say that a piece of element with similar but opposite characteristics to the glowing element should, in theory just require wiring in series as you say, and the two should balance out without the two being physically adjacent; however this may be a useful way of mounting the two, as they would both get quite hot in use. With a positive coefficient device in series with a negative coefficient device, it will be a positive coefficient circuit (the positive coefficient will effectively negate the negative coefficient as the resistance drops - it's effectively removing it from the circuit leaving only the positive coefficient value). OK, that's something of an over simplification, but it's all we need to be concerned with for this application. In short - yeah it will work. With the two being placed in close proximity to each other, it should help improve the efficiency a little, as the waste heat of the heating element will heat up the glower, thus the glower will be hotter with lower resistance. It's not a massive saving, but better than nothing (maybe 10 - 20% or so...). The glower could be made to self start once it is up to temperature, pretty much in the same way that the Nernst lamp automatically cut out the heaters (just in reverse, heater stays on, glowbar is connected / disconnected from the circuit). It's not that easy, or they would have done it back in the day. 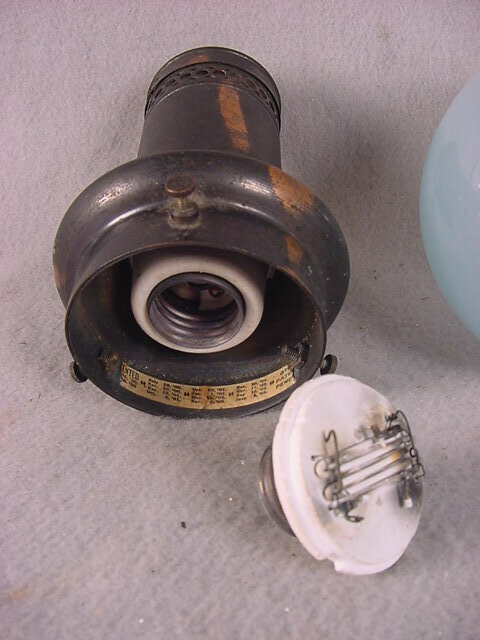 The barretter was basically invented for Nernst lamps. It's not that easy, or they would have done it back in the day. This is a lesson that I've learned many times from trying to recreate medieval technology and I'm learning again here. I think the PTC ceramic element is relatively new; the characteristics of iron barretters have been known for a considerable time, certainly they were used extensively in telegraphy. Small PTC devices were used quite a lot in valve TVs to limit current, but I think they were a sintered rather than a true ceramic construction. I wonder if anybody makes a Thermistor that works in the temperature range we need? In the old days they would say "Back to the drawing board", now I say "Back to the Google Board"
Was the barreter in the vented compartment? The first one mentions a "ballast"
You can find much better description of the original Nernst Lamp here : http://chestofbooks.com/architecture/Cyclopedia-Carpentry-Building-7-10/The-Nernst-Lamp.html . 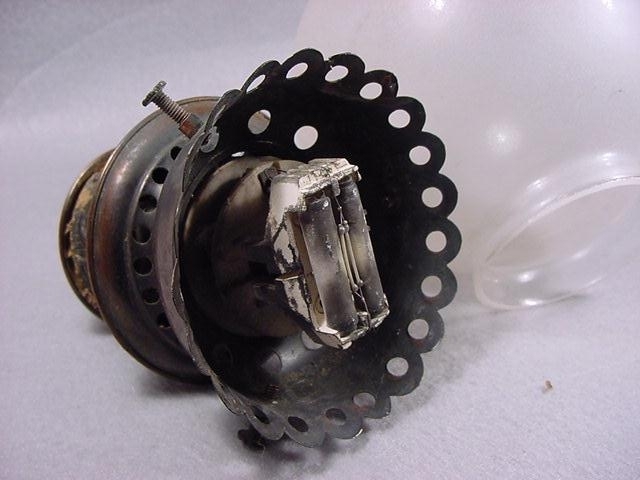 As you can see the electromagnetic relay and the iron wire resistor was hidden in the top part of the lamp . The hydrogen filled bulb was rather small : http://www.nernst.de/lamp/nernstlamp_b/nernstlamp_b.htm . If you are interested with substituting it with something which is not period-correct you may try to use standard PTC , disk-type thermistors which are used as overcurrent protection in SMPS power supplies. It seems like 30 years ago when I was building Transistor Audio Amps, that the Thermistor was placed on the heatsink with the TO3 transistors to limit the current as the transistors (and heatsink) got hotter, thus keeping them from burning up. So, why doesn't the Nernst lamp have its Barretter mounted right next to the ceramic element? Wouldn't this be the BEST place to give thermal feedback? Also, after thinking about it, the thermistor if placed close to the ceramic element would most likely melt! I think I understand what you're asking, and the answer is "No." The barretter does not react to the temperature of the glower. The barretter's wire is heated by its own resistance to the electric current flowing through it, and as the current increases, the temperature of the wire increases, and so the resistance of the wire increases, thereby limiting further increase in the current. The barretter need not (and quite possibly should not) receive any heat transfer from the glower; the feedback is entirely in the form of current flow. I see that the prices for Zirconia Ceramic Potato Peelers have dropped to 4 peelers for $4.99(including shipping) on ebay. I came across this when a member of the Antique Radio group I'm on obtained some Baretter Tubes and showed an interest in building a Nernst Lamp. Hopefully I will soon obtain a Baretter and get this project back on the front burner. Assuming you have your iron wire arranged in a suitable glass envelope, and it is filled with Hydrogen, how do you flame seal the bulb without the hydrogen catching fire? An alternative method if a full vacuum cannot be drawn (lack of suitable pump etc), is to pull as much vacuum as possible then fill with Hydrogen - repeat several times to remove air molecules and replace with pure Hydrogen, then seal as above. Looking forward to a little progress on this thread though.